RA Medications: Which NSAID and Analgesic is Best for RA? To treat rheumatoid arthritis (RA), most patients require a combination of physical and occupational therapy and prescription medications including disease-modifying antirheumatic drugs (DMARDs), biologics, corticosteroids, nonsteroidal anti-inflammatory drugs (NSAIDs), and analgesics. These medications work together to provide an optimal level of care. NSAIDs and analgesics are two of the most common forms of medication prescribed, and they each effectively target symptom relief in different ways. What are NSAIDs for RA? NSAIDs for RA are medications that reduce inflammation without the use of steroids. For patients suffering from RA, reducing inflammation is an important part of managing symptoms and alleviating pain. While NSAIDs aren’t used to stop the disease’s progression, they are strategically used in combination with other medications to help reduce inflammation. What are Analgesics for RA? Analgesics are used by RA patients to reduce the level of pain experienced from inflammatory symptoms. Often times, doctors will recommend or prescribe an analgesic to RA patients during flare-ups, or times when the disease is in its active (and most painful) state. This is usually recommended as a short-term method of alleviating pain. Analgesics are also recommended to RA patients who are unable to take NSAIDs due to prior experiences with negative side effects. NSAIDs work to reduce inflammation at the affected joints in RA patients. This reduces the swelling and pain that patients experience during flare-ups. NSAIDs work in conjunction with other medications, such as DMARDs, and their dose can be reduced as the DMARDs begin to take effect. NSAIDs do not, however, prevent the progression of bone and cartilage deterioration in RA patients. They are strictly used to help alleviate swelling and pain. NSAIDs are designed to block the patient’s “COX” enzymes. COX enzymes produce prostaglandins, which are substances that promote inflammation and pain. By blocking the COX enzymes, NSAIDs decreased the production of pro-inflammatory chemicals, which helps to reduce inflammation of the affected joints. Analgesics are a class of drugs referred to as painkillers by most people. The purpose of analgesics is to relieve the sensation of pain. When a patient senses pain, it’s because nerve endings are sending specific signals to the brain which results in the physical sensation. Analgesics interfere with the message connection between the nerve endings and the brain to block the feelings of pain. Unlike NSAIDs, they do not relieve inflammation. And while DMARDs slow and stop disease progression, analgesics do not. Analgesics are only effective at relieving and dulling pain while patients wait for their other medications to begin working. What are the Types of Analgesics and NSAIDs for RA? How are NSAIDs and Analgesics Administered? Certain analgesics and NSAIDs for RA are available without a prescription or can be purchased over-the-counter. Opioid analgesics require a doctor’s prescription. 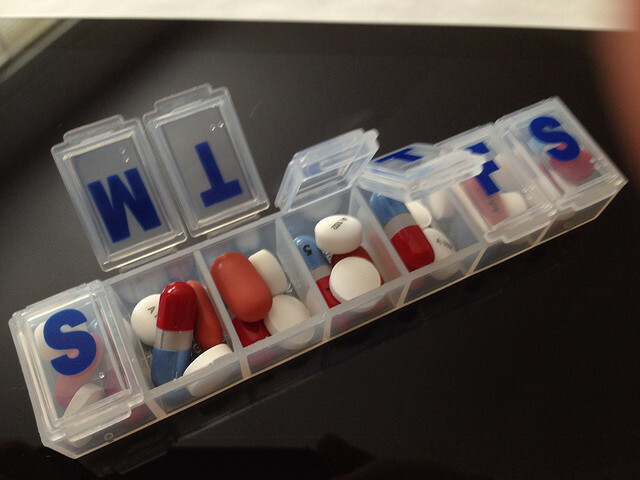 NSAIDs and analgesics are most commonly taken in multiple daily doses for short periods of time. Most types of NSAIDs and analgesics are provided in pill format (tablets or capsules). They should be taken with water and food or shortly after having eaten. There are some NSAIDs that come in a cream or gel format that you can rub directly onto the affected joints. NSAIDs and analgesics can start working in as little as 30 minutes to a few hours depending on the type and on the individual patient. Neither NSAIDs nor analgesics are taken in lieu of DMARDs or biologics. They are taken in conjunction with the immunotherapy drugs which are designed to slow or stop the disease’s progression. NSAIDs and analgesics are only used as short-term or temporary medications to relieve symptoms. Because they do not stop or slow disease progression, they are not used alone to treat RA. Analgesics are highly effective at reducing pain for patients experiencing flare-ups. NSAIDs are effective at reducing inflammation which causes pain and stiffness. They are both taken by patients while they wait for their disease-modifying antirheumatic drugs (DMARDs) to take effect. DMARDs remain the primary and most important medication for RA patients to continue to take in order to prevent further damage to joints, bones, and cartilage. NSAIDs and analgesics are two of the most commonly administered pharmacological medications. Generally speaking, they are safe when taken as prescribed. The most commonly reported side effect of both NSAIDs and analgesics is stomachache. Taking NSAIDs and analgesics with food or shortly after having eaten can help protect your stomach’s lining and prevent feelings of aches and nausea. NSAIDs do carry a limited risk of developing stomach ulcers or bleeding. NSAIDs and analgesics both carry an increased risk of heart attacks and strokes. Physicians will be cautious about which types of NSAIDs and analgesics to prescribe if the patient smokes or has diabetes, high cholesterol, or high blood pressure. NSAIDs can also possibly elevate blood pressure, so a pre-existing condition could be a concern. Other side effects may include dizziness, nausea, headaches, kidney problems, and swelling in the legs. Opioid analgesics carry greater side effects than non-opioid analgesics. Opioids also carry a greater risk of addiction. Be sure to ask your doctor before combining acetaminophen and opioid analgesics as some prescription analgesics may contain low doses of NSAIDs. While it is possible to take them together, always speak to your physician before combining analgesics and NSAIDs for RA.